Consistent slices add that visual flair to any dish. 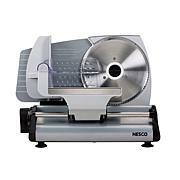 From tomato slices to king-size french fries, this slicer can come in handy for a variety of meals. 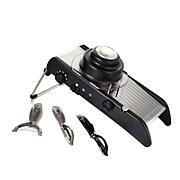 And, the hand guard also acts as a juicer for adding a little zest to your recipes. perfect for my kitchen. very durable, easy to use. this really works love it! 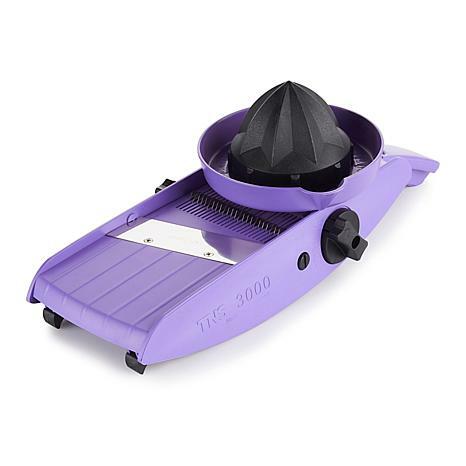 I really love this slicer and have already used it a lot for soup vegetables. Be warned the blade is sharp. I cut a finger badly first time slicing a carrot and nearly needed stitches. More careful now.My son has used it also and says it doesnt dice like the tv performance. Love how thin I get my onions now. Very pleased with the results. 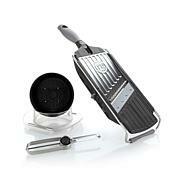 I AM KITCHEN AND BATH DESIGNER AND I TRY OUT GADGETS ALL THE TIME. I ESPECIALLY LIKE THE FACT THAT THE PIECE THAT HOLDS DOWN THE VEGGIES OR FRUIT HOLDS IT TO THE VERY END WITHOUT SLICING YOUR FINGERS. I REALLY LIKE THIS THING. MY LARGE MANDOLIN IS GOING TO TAKE A BACK SEAT TO THIS LITTLE FELLOW.